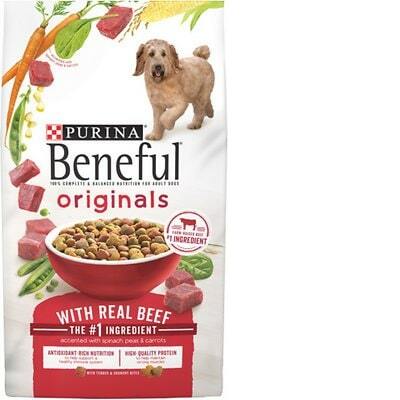 Purina Beneful Originals with Real Beef is a low-priced dog food with overall lower quality. This product has 6 controversial ingredients. It doesn't use artificial preservatives and colors but does include artificial flavors. The food also has a high amount of carbs, compared to its protein and fat with medium to low meat and fat quality. Purina has an above-average number of recalls. The company was relatively transparent when answering our questions. The average dog food we reviewed has 39 total ingredients, with 1 controversial ingredient. This product has 6 total controversial ingredients and 2 are found in the first five ingredients. This is concerning because the first 5 ingredients make up most of the product. The meats in this dog food have a mixed quality. Some are clearly labeling which animal they come from, including Beef, Chicken By-Product Meal, and Beef Fat. Others make that unclear, for example, Poultry By-Product Meal as well as Poultry and Pork Digest, which are less transparent as to their animal sources. There are no added oils, so the fat comes from the other animal and plant ingredients. The food uses Egg and Chicken Flavor, an artificial flavor. We describe above why that’s not a good thing. Purina Beneful is owned by the multinational company Nestlé Purina. It required two emails over two weeks to get the answers below. Like most large companies, many of the customer service answers will read like well-crafted marketing messages. 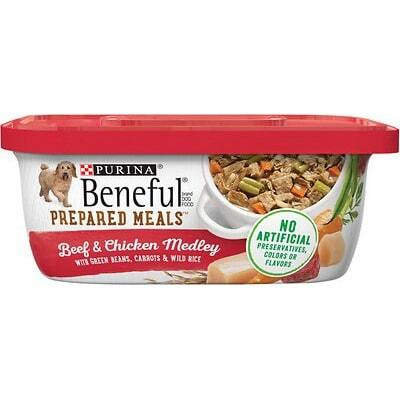 Since this representative is responding on behalf of a family of brands, they have referenced a few of the other brands that do the feeding trials, but they were not clear if the Purina Beneful line does the feeding trials.